Rating: Oh my goodness me! 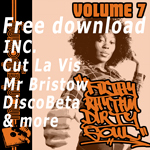 The monkey’s favourite ever sister funk cut gets a 45 re-press. 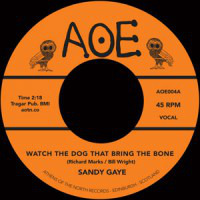 Sandy Gaye’s Watch The Dog was previously only available on seven inch for an arm, a leg, your own grandmother and a king’s ransom and even then only if you knew the right people – although you could have got it as part of Ian Wright’s excellent Sister Funk 2 LP a couple of years ago. A bona fide, take-no-prisoners, uptempo funky soul bomb, raw drums, full bass boom and Gaye stretching her lungs to near breaking point with soul. Tricky for anyone to go up against that but those Athens Of The North dogs pair it with the soul jazzy bone of Franciene Thomas’s I’ll Be There.